If you’re tired of the same old sticky-floored, squeaky-seated, stuffy cinemas, this list should help you find somewhere a little out of the ordinary to take in a flick. This relaxed outdoor cinema has a festival feel, so it’s the perfect way to combat those post-Glastonbury Festival blues. So far, West Side Story  has played in the gardens of Citypoint. Other venues include Festival Gardens, which has a stunning view of St Paul’s Cathedral, and Bleeding Heart Yard, a cobbled courtyard in Hatton Garden. Bring a picnic or enjoy the on-site street food from around the world. Lovely. This one’s ideal if you’re a little out of pocket. The incredible concrete amphitheatre near London Bridge is showing free movies throughout July as part of the city’s biggest free festival, the London Bridge City Summer Festival, which takes in venues along the embankment between London Bridge and Tower Bridge. It’s best to get there early, as films start at 6:30pm or 7pm, and tickets are first-come, first-served. Don’t forget something soft to sit on to stop your bum falling asleep! But you certainly won’t be snoozing, with the selection of great films and the stunning view of Tower Bridge. If you can’t afford to jet off somewhere tropical this summer, Big Screen on the Beach has got you covered. Sit back in a deckchair with the sand under your feet, and take in one of the great summer screenings on offer. Big Beach Screen Events is working with the Roundhouse rooftop to show cult classics, new releases and loads of family-friendly films. 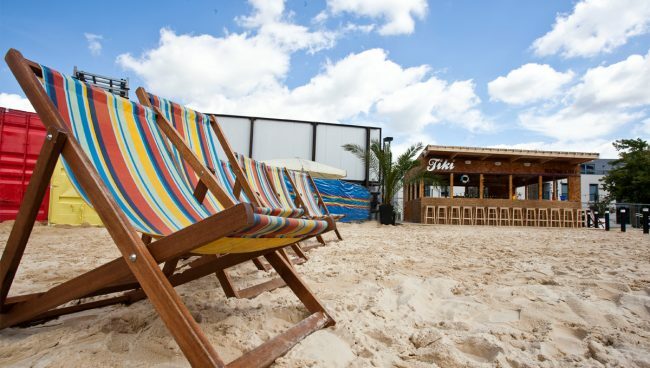 They’re also showing the action from Wimbledon and serving up tasty food and drink from the beachside bar. The Rooftop Film Club is coming to Peckham, Shoreditch, Stratford and Kensington with recent favourites, cult 80s films and a few of the old-timey classics. For a truly amazing view, the Peckham location at the Bussey Building has a panoramic outlook of the city that might make it hard to keep your eyes on the screen. Settle into comfy director’s chairs, cosy blankets or a love seat for two with provided wireless headphones to ensure you won’t miss any of the onscreen action. Time Out Live has teamed up with City Cruises for this seriously cool way to enjoy a flick and take in the London skyline. Through July, you can book a ticket to cruise along the Thames in the top deck of a riverboat and watch a selection of classic films. The open-air screen is showing retro movies, such as Back to The Future  and Mary Poppins , as well as London rom-com Love Actually  and water-themed classics like The Little Mermaid  and Jaws . With a 9pm start time, as the sun sets, this is perfect for a romantic evening or a cruise with a good pal. Time to set sail!